There are 129 nuclear reactors in operation in the European Union (EU), with a total capacity of 120 GWe, and an average age of around 30 years. Moreover, in 2016, the European Union accounted for around 43.6% of the global nuclear power consumption. Furthermore, as of January 2016, 90 nuclear power reactors have been shut down permanently in Europe. However, only three have been decommissioned completely. 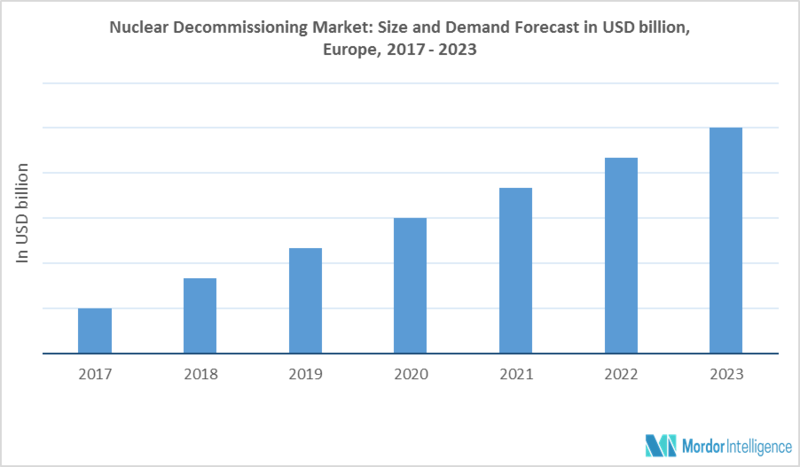 Additionally, the nuclear power generation in the region is expected to decline until 2025, creating an opportunity for the decommissioning market. Nuclear plants were designed for 30-40 years of operating life, and have to be decommissioned afterwards. However, through refurbishment and replacement, some have proved to be capable of continuing well beyond the operating life, up to maximum of 60 years. Nearly half of the global nuclear power plants are located in the European Union (EU). In 2016, the region accounted for 32% of the global gross nuclear production, with nearly 50% of it in France. Europe shows positive potential for the market growth in long term, as many countries in the region are increasing the renewable energy share in their energy mix, and are shutting down old nuclear plants, which are plenty. France is heavily dependent on nuclear power for its electricity generation. It has 58 nuclear power reactors. The average age nuclear reactor is 30 years. It is a net exporter of electricity. The country is aiming to diversify its energy mix by lowering the nuclear energy generation to 50% of the total electricity generation, from 75%, by 2025. As a result, the nuclear decommissioning market is expected to grow in the country. In the country, EDF, a French utility company, is to bear all the decommissioning costs for 58 reactors. As of June 2016, EDF has allocated around EUR 22.2 billion for decommission and waste management. EDF has estimated EUR 23 billion to decommission 58 reactors and EUR 54 billion for waste storage. January 2018: Framatome agreed to acquire the nuclear automation business of Schneider Electric, as part of Framatome's strategy to expand its instrumentation and control (I&C) offerings. MAJOR PLAYERS: Babcock International Group plc, James Fisher & Sons plc, NorthStar Group Services, Inc., Fluor Corporation, GE Hitachi Nuclear Services, Studsvik AB, WS Atkins Plc, Areva SA, AECOM, Bechtel Group, Inc., and the Westinghouse Electric Company. 8.3 NorthStar Group Services, Inc.